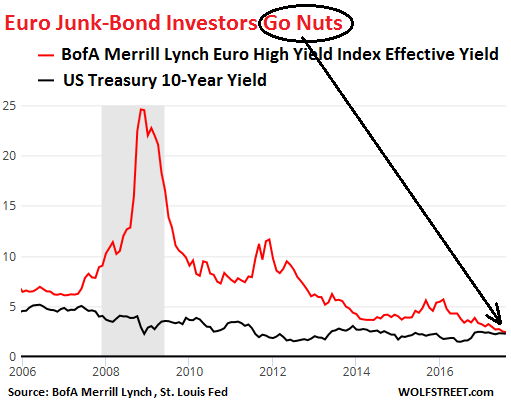 InvestingChannel: An Insane Bond Market In 4 Charts: "Italian Junk Bonds Yield Less Than US Treasurys"
An Insane Bond Market In 4 Charts: "Italian Junk Bonds Yield Less Than US Treasurys"
In our "WTF Chart of the day" from last Friday, we showed something stunning: European junk bonds yields were the same, and in some cases lower, than comparable-maturity 10Y US Treasurys. In other words, the distortion unleashed by Mario Draghi's CSPP, or corporate bond buying program unveiled last March, has made European junk bonds "safer" than US government-issued paper. These observations prompted BofA's Barnaby Martin to ask overnight "Is Euro High-Yield the new US Treasury market?." Picking up where we left off, Martin writes that "inflow surges mean bubbles…and bubbles mean tight spreads. Perhaps no better example of this is the rapid price appreciation in Euro high-yield bond prices lately. In less than a month, Euro HY yields have declined (another) 55bp, reaching an all-time low of just 2.3%." Next, Martin redoes the chart up top, and repeats that "European HY yields have almost declined to the yield on BofAML’s US Treasury index" adding that while "there are indeed duration differences between the two markets, it doesn’t detract from the eye-watering levels that European high-yield has now reached." The results become even more eyewatering if one drills down on the "higher rated" European junk bonds, those in the BB bucket: here the relative value is "even more eye-watering" as over 60% of BBs rated HY bonds yield less than similar-maturity USTs and, "ironically, €23bn of Italian BBs now yield less than Treasuries." As Martin adds here, "note that this is not just because some BBs are CSPP-eligible. There are plenty of non CSPP-eligible Euro-denominated BBs that yield less than US Treasuries." The next chart shows that the plunge in bonds yielding more than matched-maturity Treasurys started roughly around the time Draghi unleashed the CSPP, confirming yet again (in addition to the chart on top), that it was the ECB that made European junk bonds "safer" than US government paper. Finally, in an insult to fundamental analysis and credit strategists everywhere, the chart below shows what Martin calls "irony", but is instead a beautiful demonstration to what extent the ECB broke the European bond market: around €23bn of Italian Euro BB-rated junk bonds yield less than equivalent-maturity US Treasuries.